I see no shame in declaring myself to be a connoisseur of ball poppers for children, so when my wife purchased the Playskool Explore ‘N’ Grow Busy Ball Popper for our infant son, I could scarcely contain my excitement. 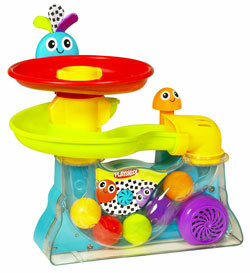 I snatched the box from his tiny little fingers and proceeded to assemble the colorful apparatus. Setup was minimal and straightforward although you will need 4 D-cell batteries to operate it. The batteries are not overly expensive, but it should be noted that they can be used as a fist-loader in a physical altercation. Initially my wife had experienced some trepidation after reading several product reviews that referenced the “loud volume” of the songs being somewhat off-putting. The product description states that “giggles are guaranteed with eight lively songs” and by “lively” they mean ear-splitting and by “giggles” they mean an aneurism. I can only assume that the audio design was borrowed from an Israeli sleep-deprivation device and as such has no way to adjust the volume which is inexorably linked to the triggering mechanism. I was able to mute the volume by removing the case screws and cutting the pair of wires leading to the speakers. I realize that this voids the manufacturer’s warranty but it was unlikely that I would ever find myself demanding a factory repair on a child’s $34 pneumatic ball-ejection device anyway. As a result of this modification the only noises I hear are rushing air mixed with childhood delight. I am somewhat leery of the “mushroom trigger” mechanism as I fear it could encourage hallucinogenic experimentation later in life. After all, why else would a multinational company manufacture a toy that conditions impressionable children to utilize a “mushroom” to produce a “fun sensorial experience?” Go ahead and roll your eyes skeptics, but you’ll wish you had paid a little closer attention to his toys once junior is 19 and the police call you because he wandered naked into a Carl’s Jr looking for his vinyl copy of a Flaming Lips album. Overall, Playskool makes a solid ball-popper despite the fact that they market educational toys under a brand-name that consistently misspells the word “school” on its packaging. The ejection mechanism works well and the clear feeder tubing provides a more esthetically-pleasing ball return system than other models I have worked with. Be advised that while it might be tempting to load a hamster into the clear feeder tube, this could prove to be rather unpleasant for both human and rodent. In conclusion, if you are looking for some wholesome family fun the Playskool Explore ‘N’ Grow Busy Ball Popper is for you.